Twitter — that perpetual outrage machine — has become the go-to social media channel for the Trump opposition. Whatever the daily Trump insult is, Democrats on Twitter are there to respond with facts, counterarguments and, yes, snark. If you live on Planet Twitter, it’s easy to believe that you’re representative of the entire universe. But a new analysis from the Hidden Tribes Project proves just how wrong you’d be. The group, whose goal is to understand the nation’s political polarization and identify ways to end it, found that Democrats are a lot more moderate than Twitter would lead you to think. According to the study, Democrats who aren’t active on Twitter are much more likely to identify as moderate or conservative. They are more likely to say that political correctness is a problem in America and less likely to follow the news closely. Blacks are also less likely to be represented on Twitter. Those findings point to real challenges for Democrats to consider as they head into the presidential campaign. 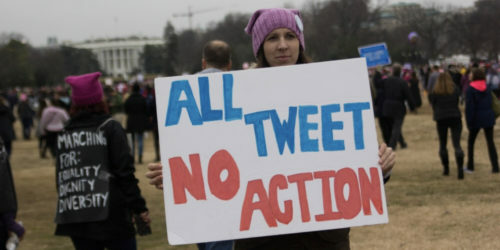 Democrats who mistakenly think that Twitter’s chorus of support for any particular issue signals that the electorate will love that issue are in for a rude awakening. Unfortunately, that may apply to LGBTQ issues as well. The study found that support for equality is a lot more complicated than top-line polling results would suggest. “Issues related to gender and sexuality still polarize Americans, despite a substantial shift in public opinion over the past two generations about the role of women and the rights of LGBTQI+ people,” the report found. In short, most Americans have come around on marriage equality. But they still have lingering concerns about the impact of changes like marriage equality on society. In some ways, all of this is good news for Pete Buttigieg’s campaign. Buttigieg’s matter-of-fact approach to his marriage and his willingness to tie it to his faith could go a long way toward addressing the irrational fears that some voters may still have in the back of their minds (and that Fox News exploits for profit). The Hidden Tribes analysis concluded that most Americans are part of an “exhausted majority” that is tired of the endless sniper fire of today’s political landscape. Yet more than three quarters believe that our differences aren’t so great that we can’t come together. If Democrats can offer an alternative for that majority, then they have stand a good chance of throwing the divider-in-chief out of office come next year.